Behind the growing success of street art there are often mechanisms that transform artists into tools in the hands of galleries, institutions and media. In a market interested both in the economy of attention and the selling of artworks, the street artist is the ideal low-cost toy. He distracts, entertains, sets trends, attracts followers and likes and has low economic claims. You don't even need to contact him well in advance, because today the offer in this environment is so wide that you have a wide margin of choice even a few days before an event. 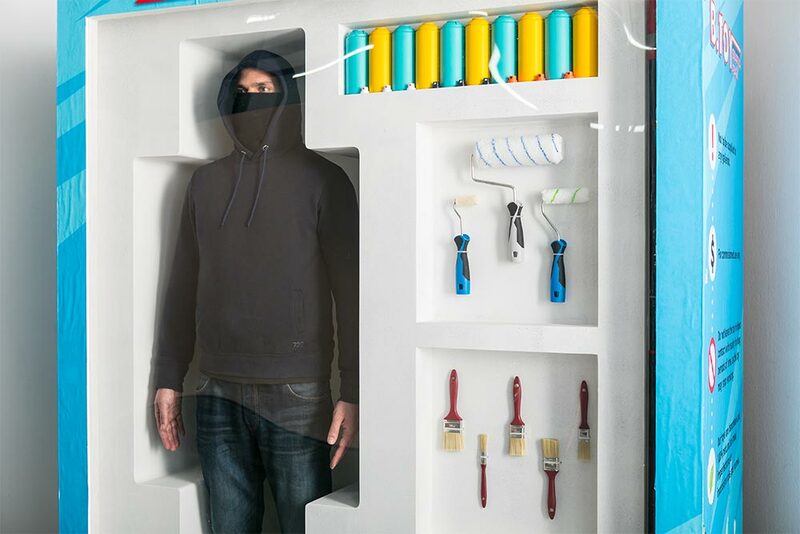 With the irony to which Biancoshock has accustomed us, B.Toy denounces the nuts and bolts at the base of modern economic insecurity, reproducing the "starter kit" of the perfect street artist, armed with a roller, spray cans, bucket and rod. 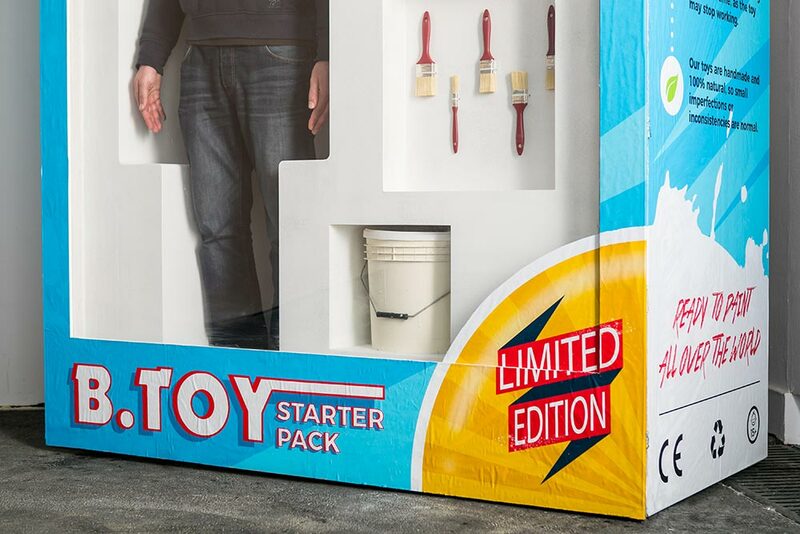 However, behind the smile of the "toy" imprisoned in the box, we can see the dissatisfaction of an artist who is denied the opportunity to experiment and transmit messages difficult to be understood. 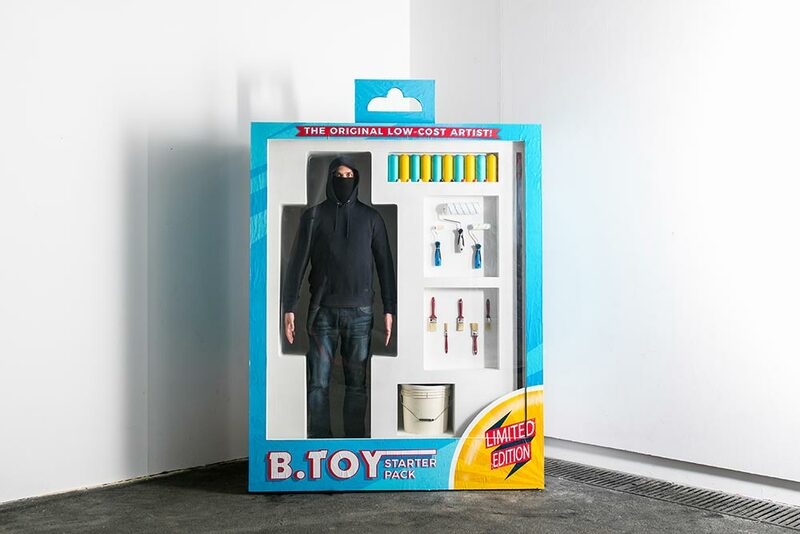 B.Toy is a self-portrait of an artist who looks at himself in the mirror to remain real, despite the forced approval and likability that success impresses on today's street art. Dietro il successo crescente della street art, si nascondono spesso dei meccanismi che trasformano gli artisti in strumenti in mano alle gallerie, istituzioni e media. In un mercato interessato tanto all’economia dell’attenzione quanto alla vendita di opere d’arte, lo street artist è un giocattolo a basso costo ideale. Distrae, diverte, fa tendenza, attrae followers e like e non ha grandi pretese economiche. Non serve neanche contattarlo con largo anticipo, perché l’offerta artistica in questo ambiente è oggi così ampia, che si ha un ampio margine di scelta anche a pochi giorni dall’evento.